Many new companies have jumped into the market in order to make the most out of the opportunities. Companies are implementing the strategies of mergers and acquisitions with other players. Some of key the players in the global acoustic neuroma market are GE Healthcare (U.S.), Siemens Healthcare(U.S.), Philips Healthcare (U.S.), Shimadzu Corporation (Japan), Toshiba Medical Systems Corporation (Japan), F. Hoffmann-La Roche Ag, Merck & Co., Inc., Novartis AG, Pfizer Inc., and others Segmentation: The acoustic neuroma is segmented on the basis of type, diagnosis, drug class, treatment, and end-users. On the basis of type, the market is segmented into unilateral vestibular schwannomas and bilateral vestibular schwannomas. On the basis of diagnosis, the market is segmented into hearing test (audiometry), electronystagmography, magnetic resonance imaging (MRI), and others. 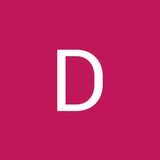 On the basis of drug class, the market is segmented into anticonvulsants, corticosteroids, osmotic diuretics and pain killers. On the basis of treatment, the market is segmented into monitoring, surgery, radiation therapy, supportive therapy and others. The radiation therapy is sub segmented stereotactic radiotherapy, proton beam therapy. Surgery is subsegmented radiosurgery, craniotomy, and microsurgery removal On the basis of end-user, the market is segmented into hospitals, diagnostic centers, academic and research institutes, and others. 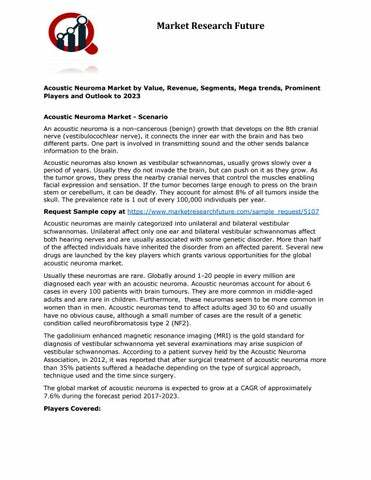 Region Wise Analysis: The global acoustic neuroma market consists of countries namely America, Europe, Asia Pacific, and the Middle East. North America is projected to hold the largest share of the global acoustic neuroma market due to presence of huge numbers of key players supporting research and development for developing novel therapies, large base of diagnostic centers and greater emphasis on disease prevention and wellness by governments. Along with that healthcare facilities in the U.S. are gradually moving from treatment to wellness, so the prevention and early detection of disease is critical. Approximately 2,000 to 3,000 cases are diagnosed each year with acoustic neuroma in the United States (6 to 9 per million persons). The European acoustic neuroma market hold the second largest market as it witness rapid growth. According to NHS U.K, an acoustic neuroma can occasionally return after treatment. This is thought to happen to around 1 in every 20 people who have had surgical removal. Asia Pacific is expected to be the most promising markets for acoustic neuroma in the near future The Middle Eastern region is expected to grow at a faster rate due to the factors such as the extensive development of health care infrastructure and growing emphasis on research and development in the health care sector.